The weather around here is still hot, but the smell of autumn is already in the air. That’s because the chile roasters have set up their stands around the city and have big burlap bags bursting with green chiles to be roasted. There are a couple of popular kinds – Hatch chiles from southern New Mexico and Chimayós from the northern mountains. Whatever the source, the process is the same: the vendor fills up a big mesh cage with fresh chiles and then turns the cage over a blazing hot fire from a blow torch or some other propane-driven device. Gradually the chiles become charred black, and the wonderful, tell-tale aroma wafts into the breezes filling the whole city with this unique smell of early autumn. Then you buy a plastic bag filled with chiles of your choice – mild to incendiary – and take them home to peel and seed and chop (depending upon what you want to do with them) so that they can be frozen away for the winter’s supply for chiles rellenos, green chile cheeseburgers, or just salsa. Of course you can do all of the roasting at home, and many folks do, but we prefer to roast on a much smaller scale. Fortunately, a device has been invented locally to let you roast just a few chiles as you need them. The Santa Fe School of Cooking, http://santafeschoolofcooking.com , sells a handy stove-top grill for $29.95. 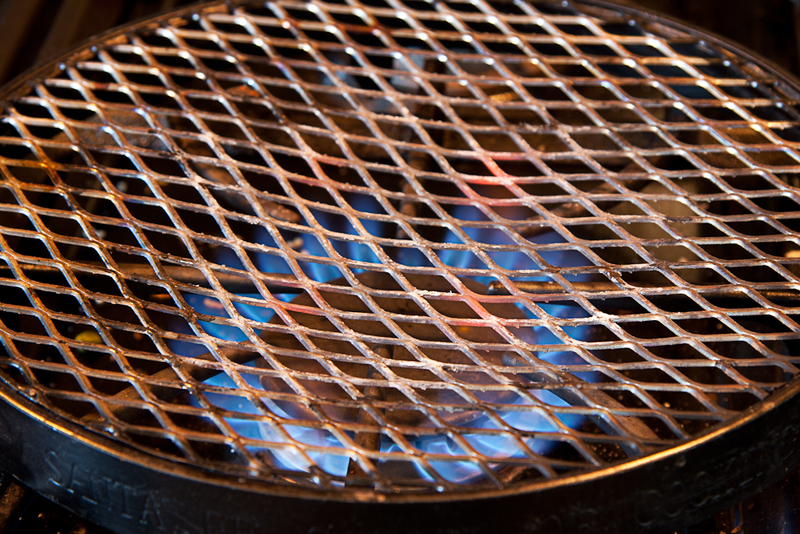 The grill is made of steel mesh stretched across a steel ring with two wooden handles to protect your fingers from the heat. In just a few minutes, you can heat up the grill, char a few chiles, and get ready for a real chile feast. 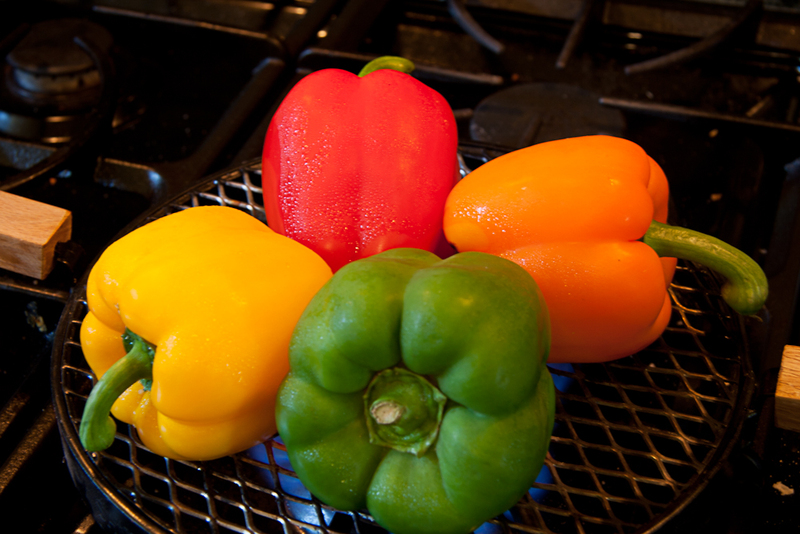 We use the grill for our allotment of Hatch or Chimayó chiles, but we also use it to roast ordinary bell peppers for an easy and delicious appetizer. So here’s what you do: Turn your stove burner on high. A gas range works much better than electric. I’m not even sure if you can use radiant heat, because you need to get your grill red-hot. Put the grill over the flame and wait until the steel mesh begins to glow. Then arrange your chiles or bell peppers on top. You can fill up the grill, but don’t crowd it as the skin of every pepper needs to get blistering hot and char. 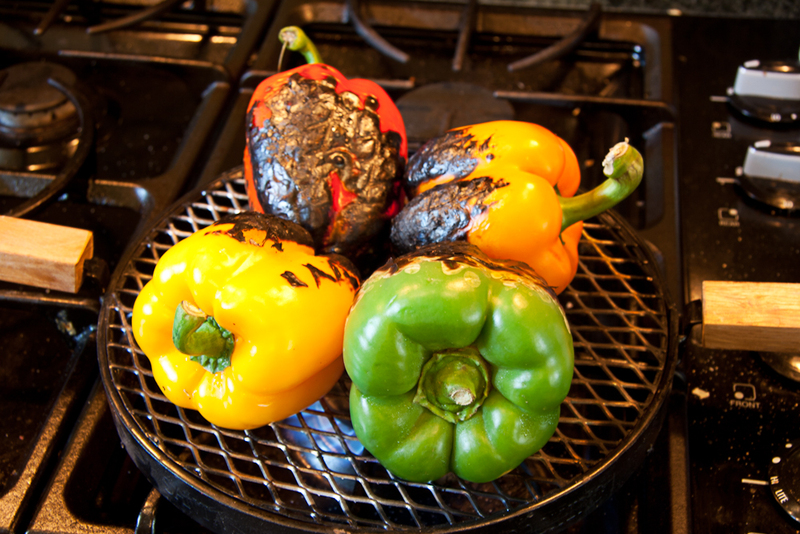 Let the peppers sit undisturbed on the grill until the surface touching the grill has completely charred and turned black. Then turn the peppers to expose another surface. Keep charring and turning until the whole pepper is black. Don’t forget the ends. Put the charred peppers in a plastic bag that can be closed or sealed, and let them cool completely. If you have done your job correctly, the charred skin can be removed easily under a stream of running water. Peel the peppers, core them, and remove the seeds. You are now ready to make smoked peppers in garlic olive oil. Place the smoked, peeled peppers on a cutting board and cut them into bite-sized pieces. Then place the pepper pieces, sliced garlic, salt, and peppercorns in a bowl that is deep enough to hold them comfortably. Add enough olive oil to cover the mixture, cover the bowl with plastic wrap, and let sit on a kitchen counter at room temperature. Two or three times each day for two days, turn the mixture, re-cover, and let marinate at room temperature. 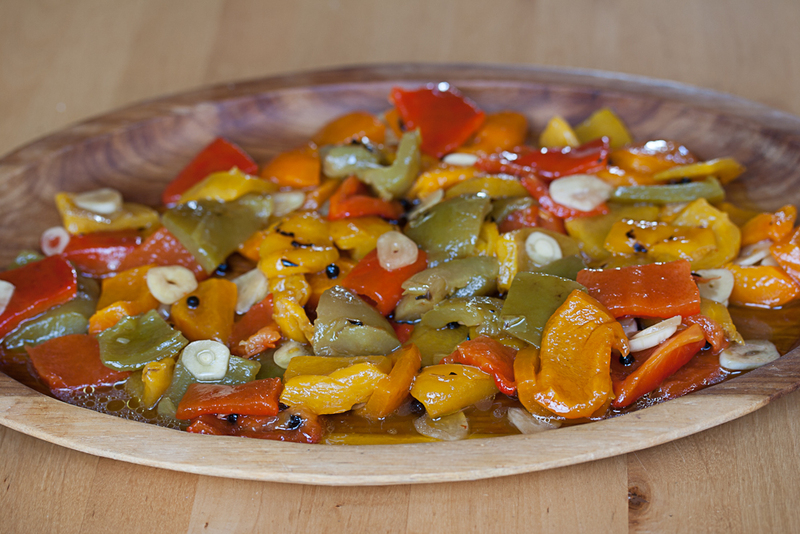 The peppers should be ready to serve with crackers or thin slices of bread so that each guest can spoon a pepper piece and a little olive oil on the cracker or bread and pop it into his or her mouth. The sliced garlic is good, too. Summer squash season is at its peak in our local farmers market. The same is true for our neighbors who grow a zucchini plant or two. There are lots of delicious recipes for summer squash, but even the biggest fan tends to grow a little weary about now. Zucchini bread and cake can’t be far away. 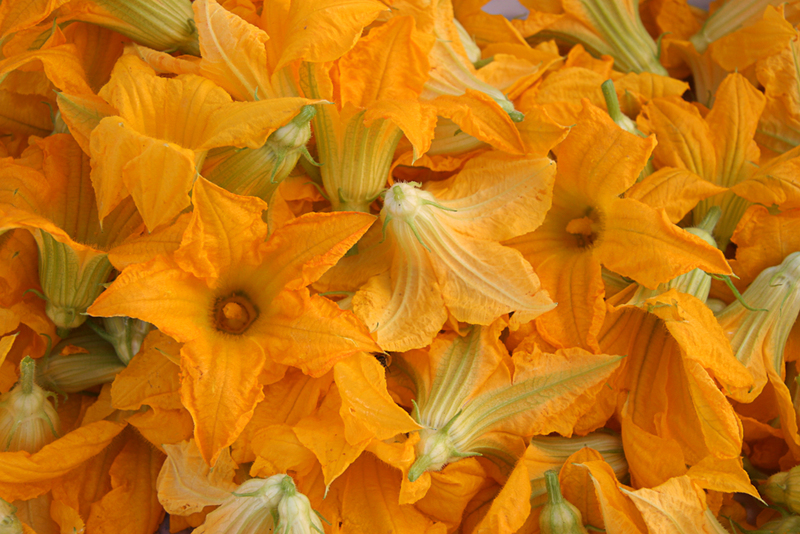 For all of that, now is the time to start cooking with squash blossoms – they are almost as versatile as the fruit itself – you can put them in scrambled eggs, omelets, soups, salads, and quesadillas. 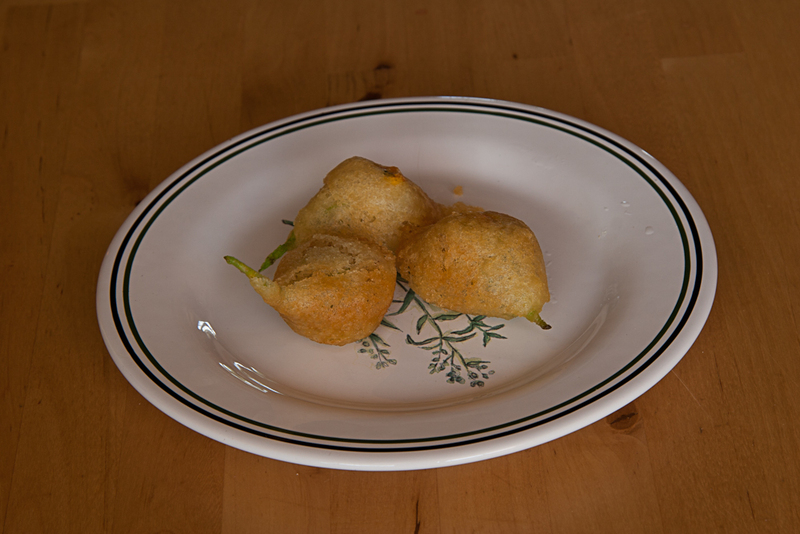 But my favorite way to prepare them is to stuff them, dip them in a light tempura batter, and deep fry them. Several vendors at our local farmers market specialize in these beautiful offerings, so it is easy to find baskets filled with golden-yellow, delicate blossoms. The farmers usually sell the flowers by the dozen, and you can pick out your choice specimens. If you are a home gardener, you can harvest your own. Select the male flowers (those growing on long stems) so you can keep your harvest of squash (that develop on the female flowers) coming until the cold weather. Whether you buy them or grow your own, you should use the flowers as soon as possible after they are picked. For those from the farmers market, try to use them that same day. They will keep for another day if you keep them in a bag in the crisper of your refrigerator, being careful not to squash them – so to speak. Some recipes call for removing the long stamen from the center of the flowers before you stuff them, but I prefer to just leave that in (it’s perfectly edible), and my experience is that trying to remove it often leaves you with a mangled flower. When it comes to a choice of stuffing, let your imagination go. Something light probably works best, and don’t use anything that takes a long time to cook, because the battered blossoms will brown in a flash. My favorite stuffing mixtures include cream cheese, good melting cheeses, mushrooms, and nuts. 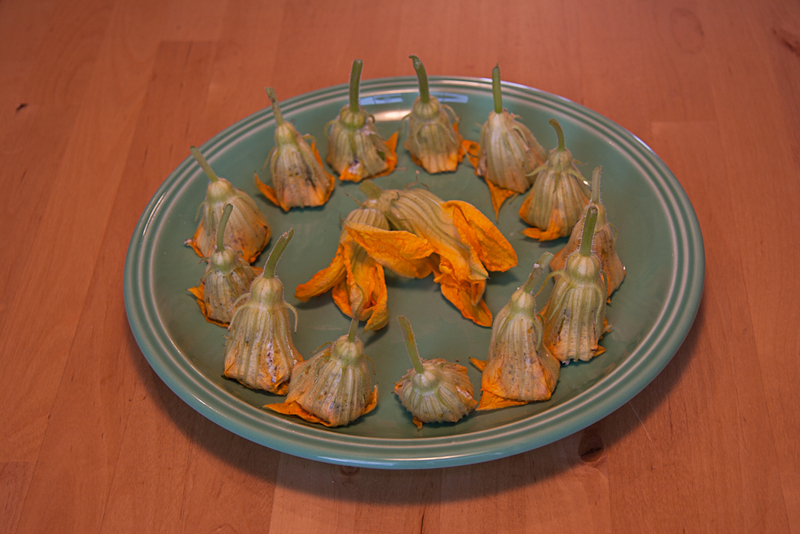 Stuffed squash blossoms are a perfect accompaniment to cold drinks on the patio, but be sure to make plenty – at least three per person – because they will disappear more quickly than a frosty margarita. 1. In a small skillet over medium heat, melt the butter and then add the finely chopped mushrooms. Cook, stirring frequently, until the mushrooms have released their moisture and it has evaporated. 2. Clean and chop the green onions, including much of the green stems. Then add to the mushrooms, along with the pepitas, continuing to stir frequently for 2 or 3 minutes until the mixture is well combined and evenly cooked. Add the seasonings and remove from the heat to cool. 4. One blossom at a time, open the flower gently, spreading the petals so that you can see the deep hollow of the blossom. With your fingers, place about a heaping teaspoonful of the stuffing mixture into the hollow and press it down carefully so that you do not split the petals. Then gently fold the petals over the stuffing, one at a time. You can use a tiny dab of the stuffing mixture to seal the last petal to the little package you have made. Place the stuffed blossom on a plate with the stem pointing straight up. 6. In a medium bowl, combine the flour, corn starch, baking powder, and salt. Then stir in the cold beer. If you prefer, you may substitute a cup of ice water for the beer. The beer will foam up. Don’t worry. The batter will be lumpy. Again, don’t worry – and don’t try to make it smooth. 7. While making the batter, heat enough peanut oil to be about 3 inches deep in a deep-sided pot. Use an instant-read thermometer to make sure the oil is at 350°. You are then ready to fry the blossoms. 8. Remove the blossoms from the refrigerator, dip them in the batter one at a time and transfer them to the cooking oil. You may fry three or four at a time, but be careful not to crowd them. Turn them once while they are frying, and remove them when they are a pale golden brown. Be careful not to let them brown too deeply. Drain them on several thicknesses of paper towels, and serve them immediately while still hot. If necessary, you can hold them for a short time in a 200° oven, but the fresher they are, the better. Just the other day we hosted the board of directors of the state chapter of the Native Plant Society. 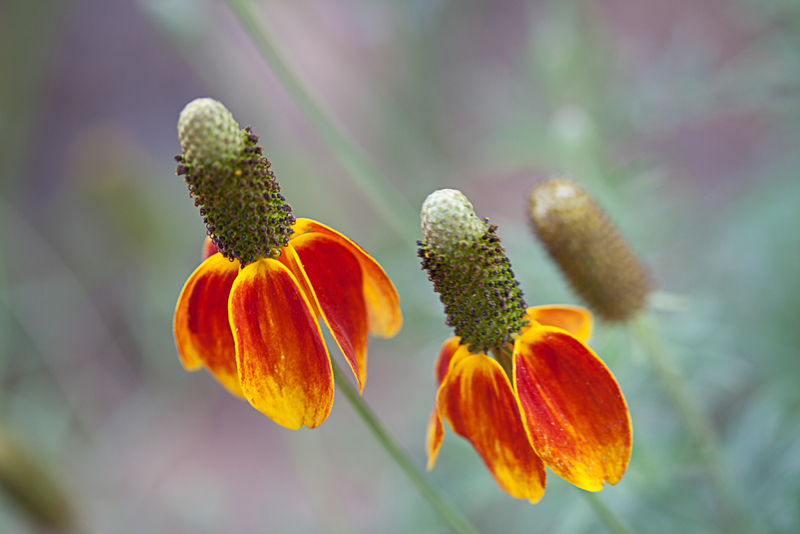 There were forty or fifty people milling around in our backyard, admiring all of the native (and xeric) plants that my good wife has made so much effort to nurture in our drought-plagued high-desert environment. 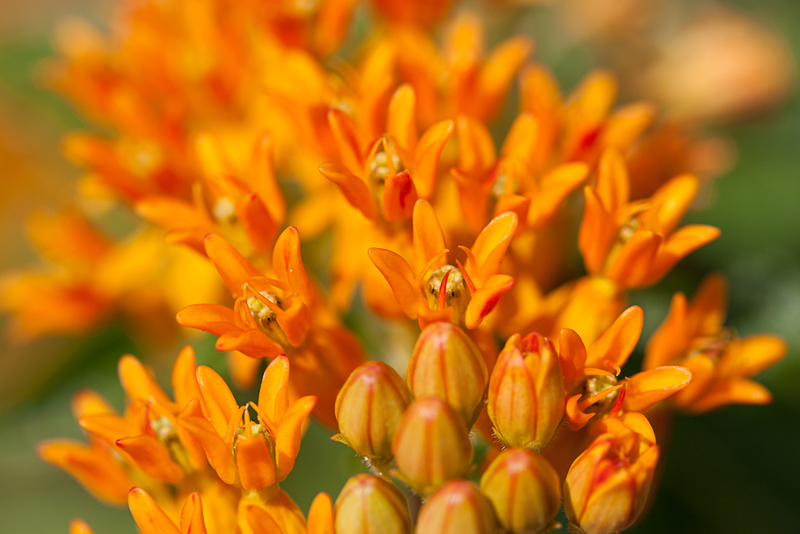 The butterfly weed had begun to fade, but its bright orange flowers created vivid contrasts with the yellows of the evening primroses and desert zinnias. 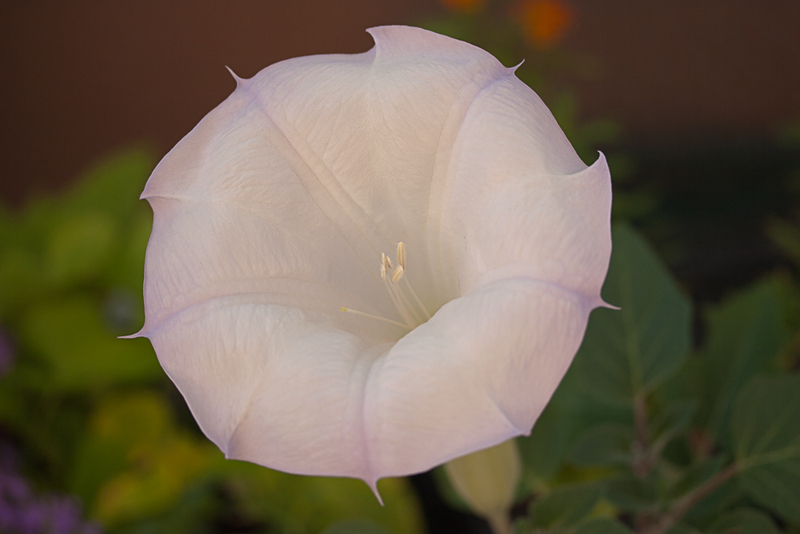 The Mexican hats showed their jaunty heads all around the garden, and the giant blooms of Datura – one of the local “weeds” that Georgia O’Keeffe so favored in her paintings – gradually faded as the evening wore on. Penstemons and salvias attracted the black-chinned and broad-tail hummers even while human intruders marveled at their acrobatics. Nature aside, the other highlight of the evening was the food that the local planning committee brought to feed the multitude. 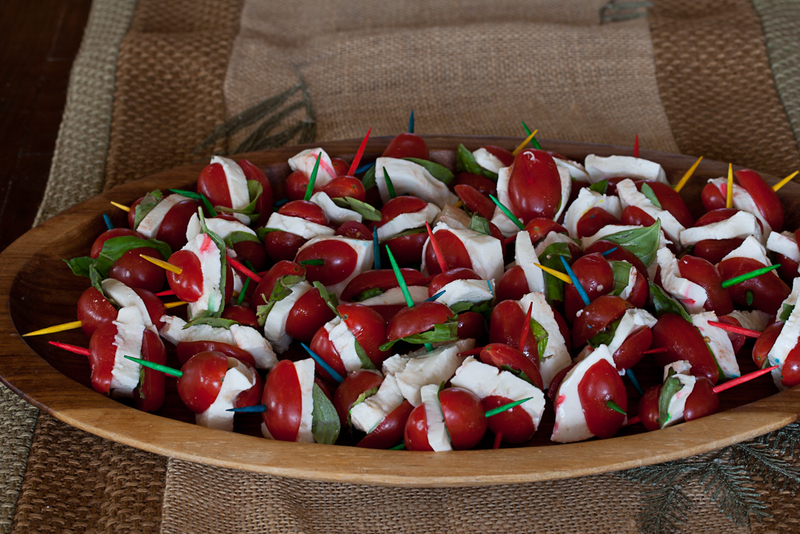 I can’t describe them all, but there were beautiful platters of unusual crudités, Vietnamese spring rolls, Belgian endive leaves stuffed with goat cheese and pecans, and little individual capreses made with cherry tomatoes, fresh mozzarella and basil leaves on a stick. My contributions were gravlox made from wild Alaska sockeye salmon, Swedish mustard sauce, and bacon-wrapped dates stuffed with pimentón-dusted marcona almonds. One person worried about possible infections from cured salmon. The risks seem minimal, and there is no consensus on what the risk actually is. Since almost all seafood in our local stores comes to us already frozen, there is probably no risk, but if you are really concerned, freeze it again. The recipe for mustard sauce comes from a dear friend from Sweden. Place one filet, skin-side down in a deep glass bowl or pan. Cover with the dill. Then sprinkle with the salt, sugar, and pepper. Cover with the remaining salmon filet, skin-side up and cover with plastic wrap. Weight down with a heavy pan or several cans of food, and refrigerate. Turn the fish twice a day for three days. A liquid marinade will develop. Spoon this over the fish as you turn it. Then recover, replace the weights, and return to the refrigerator. When you are ready to serve, remove the salmon from the pan, scrape off the dill and peppercorns, and slice with a very sharp knife held almost flat against the surface of the fish. If you do this correctly, you should get very thin slices without cutting into the underlying skin. A special salmon slicer works best. Place mustards, vinegar and sugar in a small bowl and whisk until the sugar is dissolved. Add the oil in a thin stream, beating continuously. Stir in the chopped dill. Serve. “Elegant” and “barbecue” are two words that don’t seem to go together, and the concept seems to be an oxymoron. But recently my daughter and son-in-law prepared a feast for a client showing that you can create eye-popping food from old barbecue standbys. 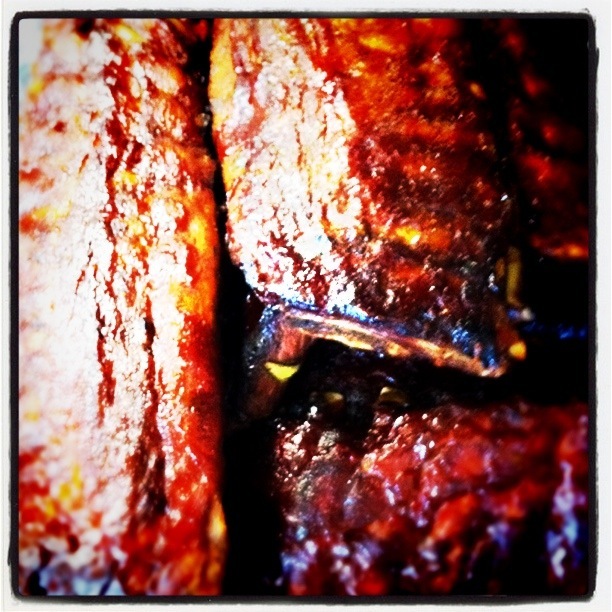 Of course, the main event – ribs – is something that you don’t want to mess with, especially if you are the weekend grill king and have a recipe that goes back to your grandfather. But the side dishes can be as complex as your imagination. 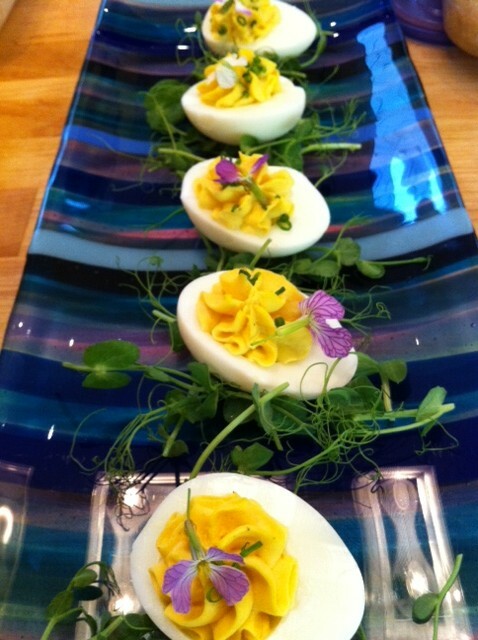 For example, deviled eggs are usually pretty ho-hum. 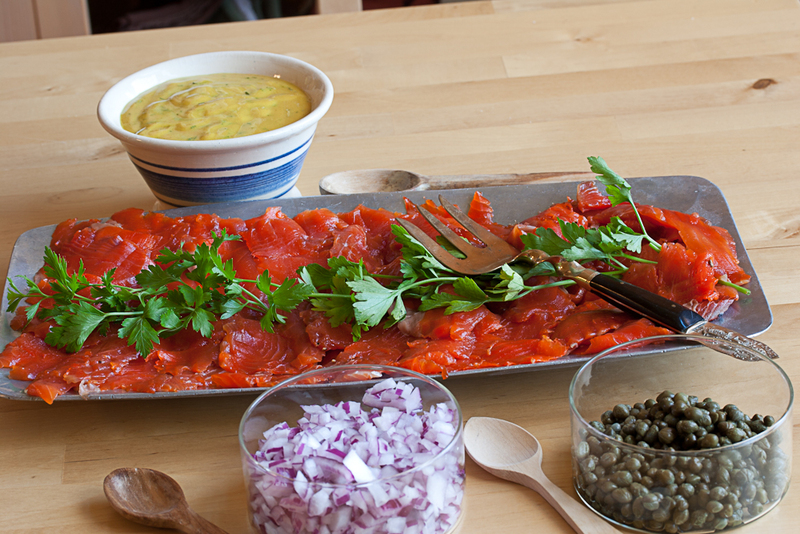 Try to add some spice by using something like smoked trout.. You can do it easily if you have a backyard smoker, but you can even do it in your kitchen with a Cameron stove-top smoker. Follow the directions, put a heap of wood chips in the bottom, close up the top, turn on the heat to medium, and smoke for 20 minutes or so. Just be certain that the lid fits tightly and is completely sealed. Otherwise the smoke alarm will disturb the neighbors. When the fish is smoked and the heat is off, carefully remove the lid of the smoker and transfer the trout to a cutting board where you can remove the skin and bones. Then flake the fish and mix it with a little of the sieved egg yolks from your hard-boiled eggs. Season as you wish and pipe the mixture into the waiting egg white halves. Decorate with whatever comes to mind – a sprig of fresh dill, a dab of caviar, or edible flowers. Hot dogs are pretty standard barbecue fare, and for me, nothing beats a well-grilled hot dog topped with ketchup, mustard, relish, onions, and whatever else you can think of. Still, the lowly hot dog can hardly be considered elegant. 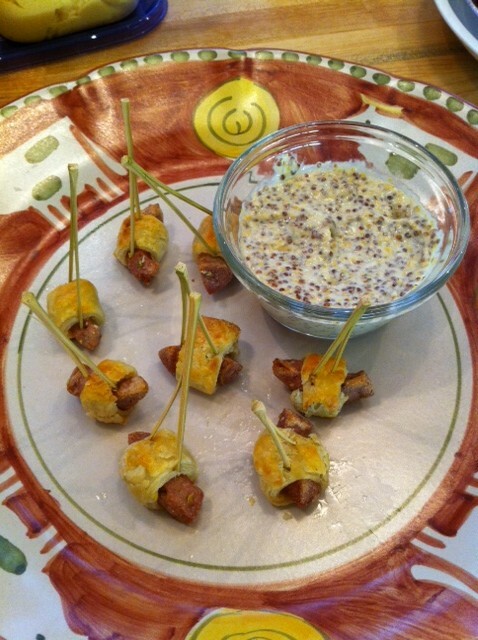 Here’s how you dress it up – try tiny little mortadella sausages wrapped in pastry as pigs-in-a-blanket, and serve them with a piquant mustard-seed dipping sauce. 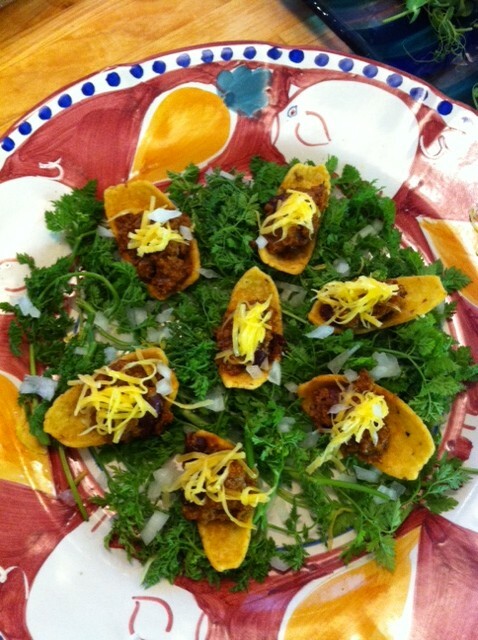 Even chili and corn chips can be dressed up. Use your favorite chili recipe, preferably without beans, and then spoon it into those big corn chips designed for scooping dips. 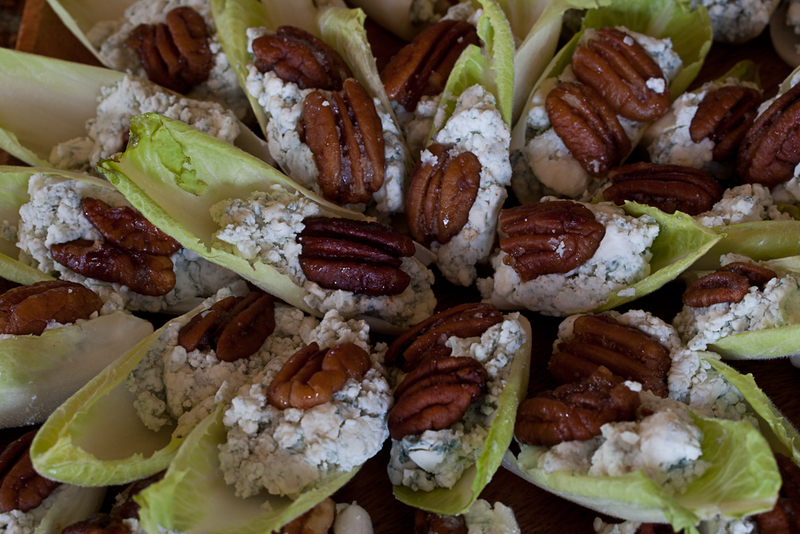 Garnish each one with a dab of sour cream and a sprinkle of grated cheddar cheese. Arrange the individual chips on a bed of lettuce and let the guests have a go. You and they will all have a good time with this twist on old-fashioned Frito pie.